The Vic Firth MB0H Marching Bass Drum Mallets have been field tested and field proven throughout years of collaboration with the world's finest drum and bugle corps. 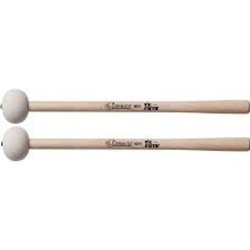 The Vic Firth Marching Bass Drum Mallets feature tapered hickory shafts, which shift the weight of the stick towards the hand for improved balance and control. Spherical heads provide a consistent striking surface. The MB0H was designed for 14" - 18" marching bass drums. Super hard felt heads.